There is plenty of fish imagery in the New Testament (fishers of men, the feeding of the 5000 with five loaves and two fish, cast down your nets, etc.) but this is different – Jesus not as a fisherman or ichthyphage, but as a fish himself (a parallel situation to his portrayal both as a shepherd and as a lamb). How did this happen? 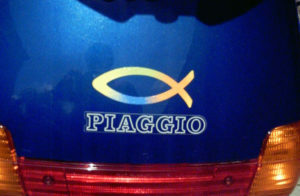 Putting aside pagan-holdover theories of fish representing primordial life, the standard line is that fish, in Greek, is ΙΧΘΥΣ (“ichthys”), and forms an acronym for “Ίησοῦς Χριστός, Θεοῦ Υἱός, Σωτήρ” (i.e. “Jesus Christ, Son of God, Savior”). 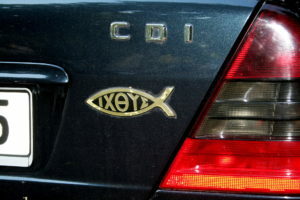 The movie Quo Vadis (1951) depicts Christians recognizing each other through the use of the sign: one would draw a semi-circle, and the other would complete the fish with another semi-circle. 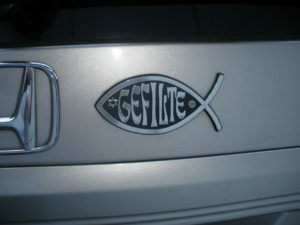 According to Wikipedia, the Jesus fish was revived in the 1970s as a symbol of contemporary Christianity. Also according to Wikipedia, in the early days of Christianity, ΙΧΘΥΣ could be rendered as an eight-spoked wheel, if one lays all the letters on top of each other. 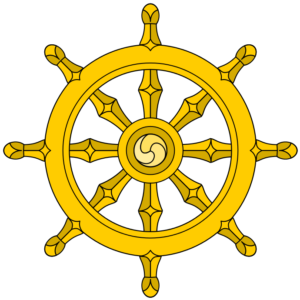 It would be great to revive this as a Christian symbol, although it might conflict with the Buddhist symbol of the Dharma Wheel, representing the noble eightfold path. This entry was posted in Art and Art History, Church History, Design, Religion by jgood. Bookmark the permalink.